eduroam (education roaming) is the secure worldwide federated network access service developed for the international research and education community. It provides per-user, per-session encrypted network access for visitors from participating institutions, without the need to gain guest credentials on arrival to an eduroam enabled location. The connectivity is instantaneous and the infrastructure is authenticated by the user. The eduroam network is the most recent addition to this portfolio. It was implemented by the Office of Information Technology in August 2013 as per the direction of Dr. Kathy Gates and Robin Miller. This is designed to be a supplementary network, which provides simple and secure guest access for researchers, teachers, and students, who are visiting institutions other than their own. The OleMiss network also provides guest internet access. It accepts sponsored accounts and can be used by any visitor, not just other eduroamers. So why do we care about eduroam? In other words, eduroam is beneficial to both visiting guests and our own users. All UM employees and students can use it when away from campus. It also serves as one tool that can help keep information secure while traveling. The network uses standardized encryption technology, and it is designed to provide a more secure connection than traditional public hotspots. This service joins UM together with academic communities from all over the world. We are part of a global network that includes over 5500 locations. It is one of the largest roaming networks of its kind. Through this effort, we effectively promote global research, enhance the value of tuition, and increase the availability of internet access. 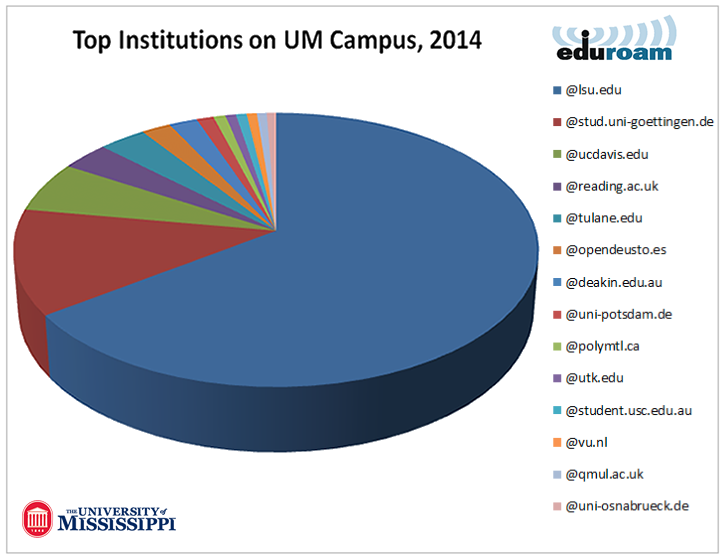 LSU took the top spot as the most frequent eduroamers on-campus. They were early leaders in the adoption of eduroam and our close proximity makes us prime candidates. Similarly, you can connect to their eduroam network using your UM Email next time you are in Baton Rouge. The University of Göttingen came in second on our list. This was likely by way of our student exchange program. More UM students are connecting to eduroam from off-campus locations as well. When you connect to eduroam from off-campus just be sure to enter your full olemiss.edu email address. The eduroam network accepts both GO (student) and UM (employee) email addresses. For detailed instructions on setting up the connection please visit wifi.olemiss.edu. Network availability is dependent on voluntary institutional participation. 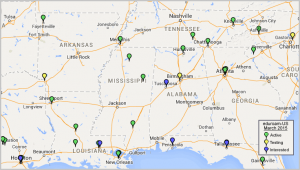 Aggregate coverage is the product of all wireless hotspot locations provided by all member institutions. In order to ensure proper coordination, each institution operates under the umbrella of their particular geographically defined federation. 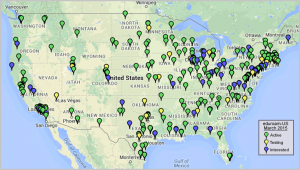 UM itself connects through Internet2 network and is a member of the eduroam-US federation. As shown on the regional map, if you happen to be visiting MSU and need to connect an iPad or catch up on Netflix, you are now welcome as an eduroamer. Just choose eduroam from the list of available WiFi networks and enter your UM Email. Once your device is initially set up it will automatically connect whenever it comes within range of any eduroam location. 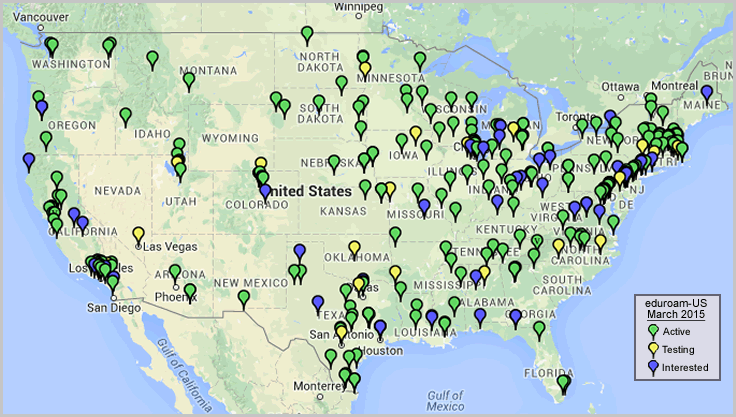 On the eduroam-US national map you can see where pockets of coverage are starting to form. Bear in mind this map uses a single marker to represent an entire institution, but each institution shown will actually have many eduroam hotspot locations. For example, UM is currently broadcasting the eduroam signal through approximately 2400 wireless access points and in five separate towns. Other institutions will have proportionally comparable network infrastructures. 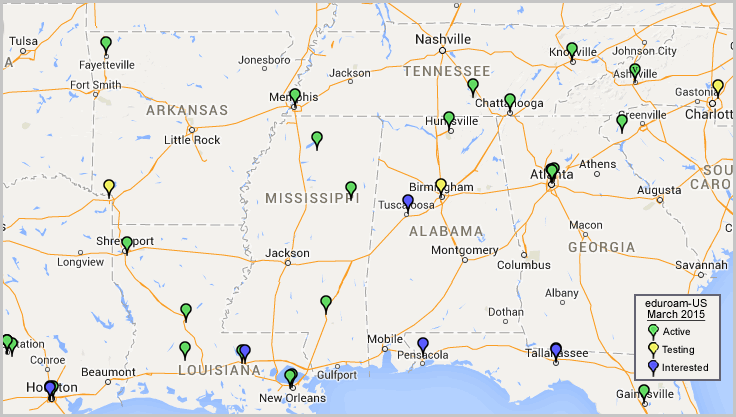 Considering this, nationwide coverage density is actually better than it might first seem on the eduroam-US map. The US federation consists mostly of larger universities today. It is possible for any research or education based institution to join eduroam though. This includes all universities, colleges, K-12 schools, hospitals, libraries, research labs, and research departments of companies. 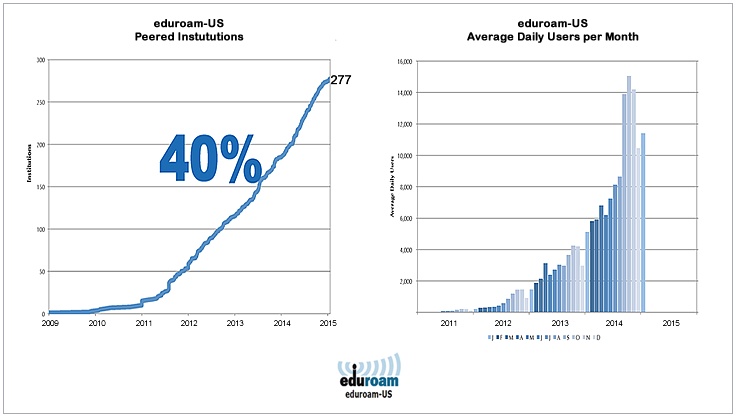 We may see more diverse types of organizations joining eduroam-US in the future. The concept of eduroam first started in Europe in 2003 through the Task Force on Mobility. Europe has a high rate of participation and members that are often within close proximity to one another. This makes for comprehensive coverage and a consistent roaming experience, especially in larger European cities. Today eduroam is funded in part by the National Science Foundation and Internet2. It has continued to gain momentum throughout the global research and education community and is now available in 71 territories. Be sure to check out the where page of the eduroam.org website for more information about all of the international federations involved. 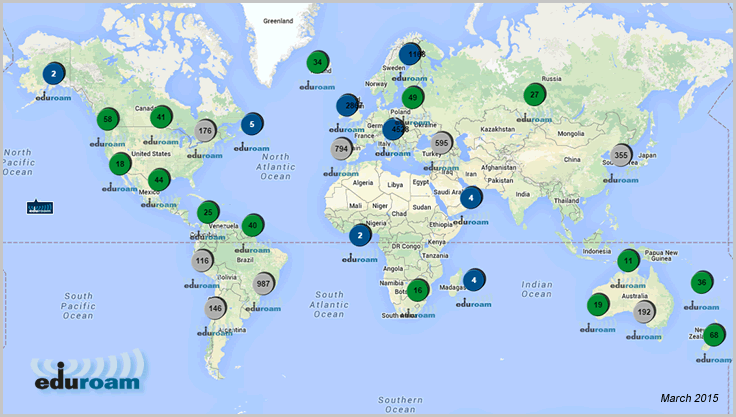 The global map gives a more complete feel for total network coverage provided by the eduroam federations their institutions. The color of the icons on the map indicate the number of underlying hotspot locations and density of coverage. Next time you are traveling be sure to check out the official global eduroam map. You might be able to use your UM Email for free voice and data services. As a reminder, eduroam is only to be used when you are a guest at another participating university. In other words, a UM Email will not connect to the eduroam network at a UM campus. However, a UM Email will connect at all other locations. Be aware of any policies of the university you are visiting for any local network restrictions. Some institutions may restrict your ability to access specific network services or websites. This control is up to the discretion of each individual institution. Technical support for eduroam is provided by the home institution. This means visiting students will need to contact their home institution for assistance. UM students, faculty and staff visiting other participating institutions should contact the IT Helpdesk for assistance.